Hallandale Beach Commissioner Michele Lazarow (left) wants to censure Commissioner Anabelle Lima-Taub. 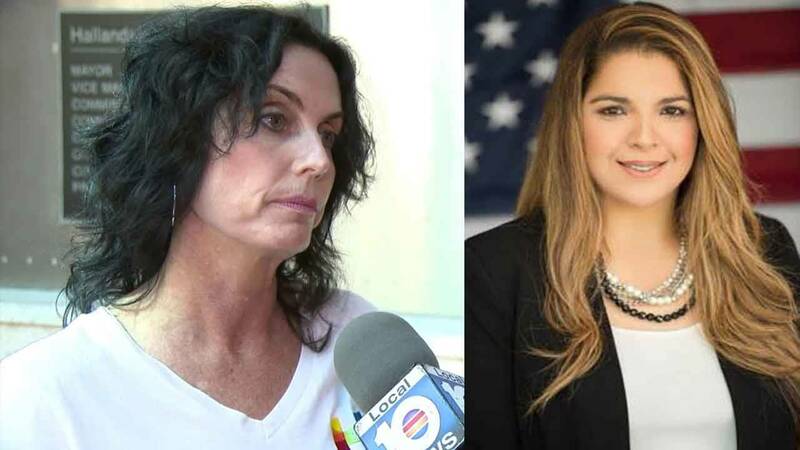 HALLANDALE BEACH, Fla. - A Hallandale Beach commissioner said she has "absolutely no intention on resigning" despite calls for her to do so after she wrote online that a newly elected Muslim congresswoman could "become a martyr and blow up Capitol Hill." City Commissioner Anabelle Lima-Taub signed an online petition seeking to remove U.S. Rep. Rashida Tlaib, D-Mich., from office. She posted the petition on her personal Facebook page. Fellow Commissioner Michele Lazarow is sponsoring a resolution to censure Lima-Taub in the wake of her "hateful and bigoted remarks." "I believe we need to take action as a city," Lazarow said in a statement Wednesday. "I commend my colleagues who have spoken up to make clear that Hallandale Beach is a diverse community that welcomes everyone. Now I hope they will join me in taking this a step further through this official action to condemn the offensive remarks that were made. We must send a message to our community that this behavior won't be tolerated." 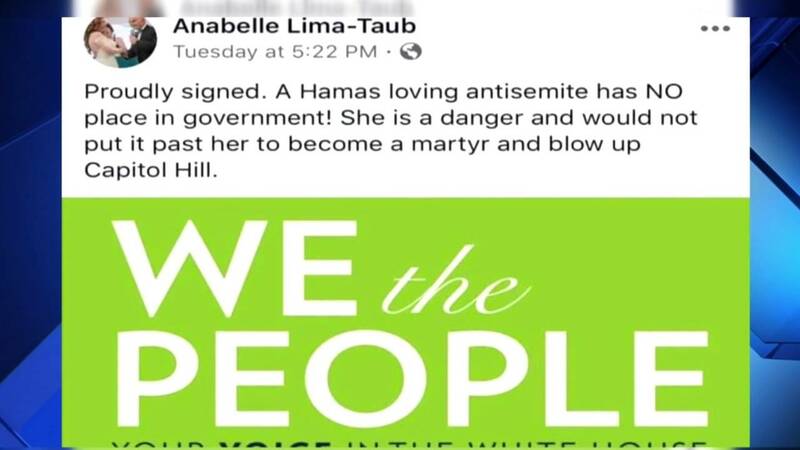 But Lima-Taub is standing by her comments, writing on Facebook that she is "offended by anyone who is NOT OFFENDED" by Tlaib's "hateful rhetoric" and "other radical dangerous views calling for the obliteration of Israel, literally off the face of the map." Tlaib recently made headlines for using profane language in her vow to impeach President Donald Trump. 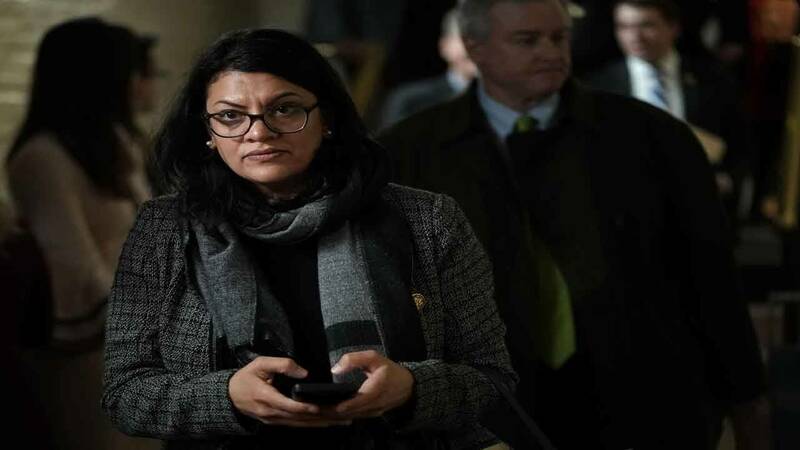 U.S. Rep. Rashida Tlaib, D-Mich., leaves after a caucus meeting at the U.S. Capitol, Jan. 9, 2019, in Washington, D.C.
"This country affords her the right to freedom-of-speech, and I remain unapologetic for my views that she is a danger to the peace process and demand an apology of her for relabeling Israel as Palestine on a map hanging on her wall in her congressional office," Lima-Taub wrote. Lazarow said she disagrees with the congresswoman's stance on Israel, but "those disagreements are resolved through debate and elections, not through promoting bigoted stereotypes that have no basis in fact." Attempts by Local 10 News to reach Lima-Taub for comment have been unsuccessful. Lazarow said she would consider withdrawing the resolution if Lima-Taub "comes to her senses and gives a sincere public apology" before the city's Jan. 23 commission meeting. "If not, I believe we must take action to show all who are watching that Hallandale Beach isn't a place that tolerates hatred and bigotry," Lazarow said.